In medium size bowl, combine flour, oats, baking soda, cinnamon, and salt. Mix well. In separate bowl, combine bananas, brown sugar, sugar, oil, water, and vanilla. Mix well. Combine banana mixture into the dry ingredients. Stir well. 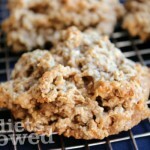 Allow cookie dough to sit for 5 minutes to allow oats to absorb any remaining liquid. Drop cookie dough by large spoonful on greased baking sheet. Bake for 13 minutes until the bottom is brown. The cookies should still be soft to touch. Enjoy them warm!